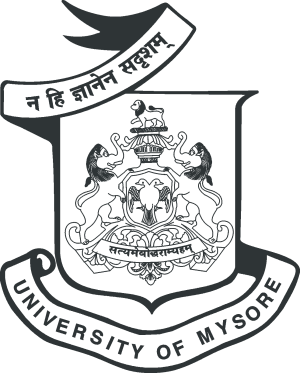 The University emblem is adapted from the Royal Emblem of Mysore. It depicts the bird Gandabherunda flanked on either side by the lion-elephant Sharabha (mythical creature believed to be stronger than the lion and the elephant, and upholder of righteousness), surmounted by a lion. The motto of the University, as envisaged in its emblem is, "Nothing is Equal to Knowledge" and the second line "I Always Uphold The Truth"summarizes the vision, moral fabric and idealism of the Founders and of the University.